RCB: Let’s talk Venom. After taking the reins from Rick Remender, you have really come into your own with this series, especially with the recent “Broxin” arc. Can you tell us a little bit about Eddie Brock and the Toxin symbiote and your ideas for him moving forward? Cullen Bunn: Rick and I had introduced the idea of Eddie Brock as Toxin during the “Savage Six” arc of VENOM that we wrote together. At that stage, Toxin was really this hulking, near-mindless monster, nearly consumed by hate. When I took over the book, I knew that I would eventually bring Toxin back into the story, and I knew that I wanted to reinvent him to some degree. By the time Toxin reappeared, Eddie and the symbiote had come to terms with one another. I wanted him to be more like the “Lethal Protector”—an anti-hero of sorts. Right now, he’s lurking somewhere around Philly, keeping an eye on Venom and occasionally busting heads while he’s at it. I think there are definitely more stories to be told from the “Broxin” perspective. RCB: What makes the Toxin suit such a great fit for Eddie Brock? Cullen Bunn: Toxin and Eddie have something very powerful in common—they both hate Venom. Initially, that was enough to make them the perfect partners. Now that Eddie has seen that Flash has the potential for good, Eddie and Toxin have to turn their anger toward other targets. 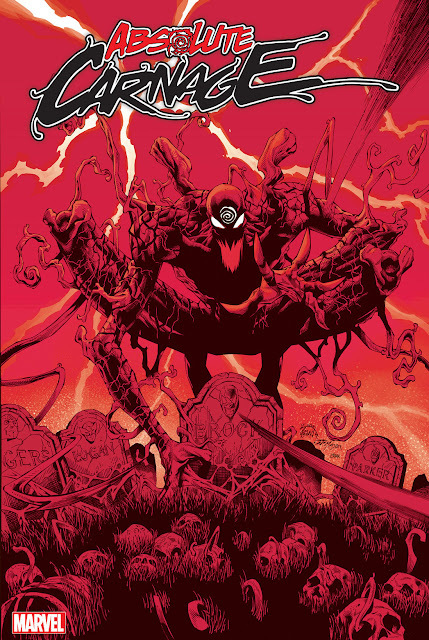 RCB: Venom #36 starts a new arc, and introduces a new villain known as Lord Ogre. Can you tell us a little bit about this guy and what threats he poses to Agent Venom in this new arc? Cullen Bunn: When I started thinking about establishing Venom as a real hero for the city of Philadelphia, I decided he needed resources—allies and suppliers and informants—but he also needed a rogue’s gallery of sorts. Lord Ogre was the first of them, a really powerful, really influential, and really strange guy who is almost a religious figure in Philly’s underworld. He’s going to set a fire, so to speak, that will threaten to tear Venom down before he really gets started… and will pave the road to some big changes in Venom’s life. Lord Ogre isn’t one to get his hands dirty, but he certainly believes in overkill when it comes to hiring killers. RCB: Speaking of this new arc, along with a new villain and a new direction we’re also getting another new artist. Was this always the plan for Venom, to switch up artists with different arcs, or can we expect a more regular artist in the future? Cullen Bunn: I think the plan is always to find a regular artist for the book, but that’s not always a simple feat when you’re balancing shipping schedules with artists’ schedules. But I think the artists on the next couple of arcs—Kim Jacinto and Jorge Coelho—are really gonna wow readers. I’m very lucky to work with both of them. RCB: It was also recently announce that issue 40 would see the introduction of a new symbiote female, can you tell us a little bit about her? Cullen Bunn: Her name is Mania, and she’s going to be a big headache for Flash Thompson… and she will actually debut before issue 40. Her first appearance will be in issue 38, I believe. I think her origin will be surprising for a number of reasons, not the least of which is she will seem to have a much more “pure” connection to her symbiote than Flash has with his. Cullen will answer our TVS questions later this week!